Today, the Bad News Ems bring good news as they add another first to their history, receiving the Larry MacPhail Award, symbolizing the team with the top promotional effort in all of Minor League Baseball. The award has been presented since 1966 and is named after Hall of Famer Leland Stanford "Larry" MacPhail, Sr., who introduced innovations such as night baseball, airplane travel, pension plans and batting helmets. Only one team in all of Minor League Baseball receives this award each year, spanning over 160 teams in total, in recognition of the most tremendous and unique promotional and community efforts. This includes all levels of MiLB, from Triple-A to Rookie ball, from Pawtucket to San Jose. The Ems are just the 6th short-season club to receive the MacPhail Award since its inception over 50 years ago, as over 60% of previous winners have been from the Double-A level and above. The Emeralds will receive their award at the Baseball Winter Meetings Banquet on Sunday, Dec. 9, at the Mandalay Bay Resort in Las Vegas, Nevada. 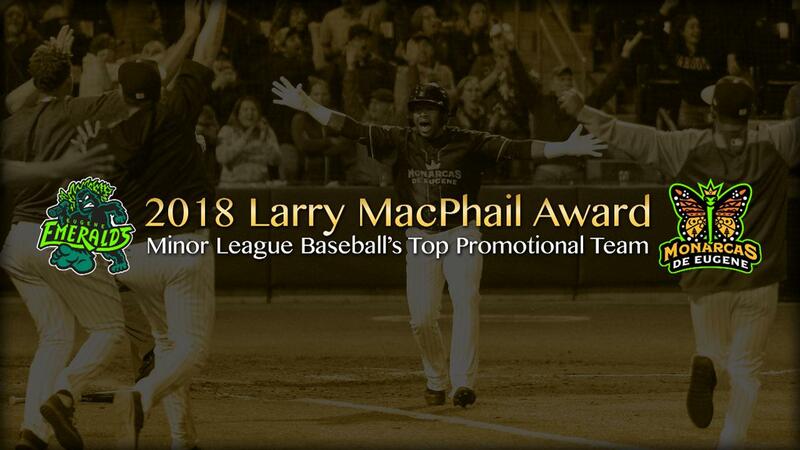 "The Larry MacPhail Award is the most sought after achievement in Minor League Baseball. We are so proud of the Ems and the great staff led by Allan Benavides," said D.G. Elmore of the Elmore Sports Group. "Winning this award is not just an award for the Emeralds and the Elmore Sports Group, but also for what is possible in a smaller market and short season baseball through creative thinking and hard work." The Ems are the first Northwest League team to ever win the Larry MacPhail Award, earning the prestigious honor after 8 straight nominations from the Northwest League. Over the last eight years, the Emeralds have won Golden Bobbleheads for Best Charity Promotion or Event (2011), Best In-Game Promotion or Event (2014) and Best Community Promotion or Event (2016 - also won the Best Overall Promotion Award). "We are so honored to be the first Northwest League team to win this award, as this league has some of the best operators and owners in all of Minor League Baseball, and after being nominated for several years, to finally win the award is just tremendous," said Benavides. "Our staff works tirelessly year-round to keep our brand top of mind and our fun, and sometimes experimental, promotions would not be possible without all the fun and creative colleagues we have in this industry whom we continue to learn from each and every year." The Ems pride themselves on providing an unmatched entertainment experience at PK Park, filled with unique theme nights, sought-after giveaways, and plenty of efforts to better the local Eugene-Springfield community. With plenty of classic nights such as Star Wars and Princess Night, new escapades like a Superhero Cape Beach Towel giveaway and Arm Wrestling Night, each game at PK Park promises an incredibly unique adventure.